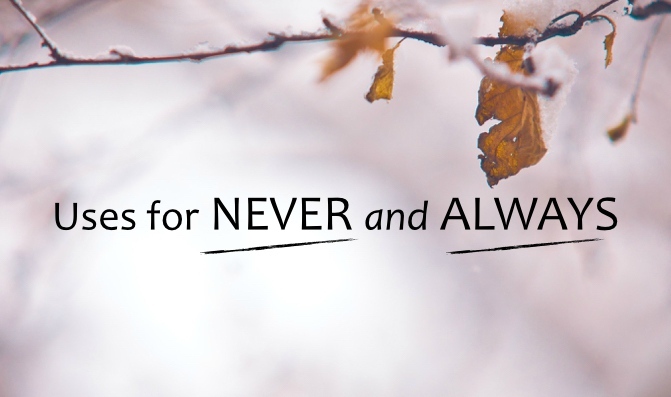 We’ve all heard it said, “Never say ALWAYS or NEVER.” And I think there is some wisdom in that. These words can easily set us up for major failure. In the right context, however, ALWAYS and NEVER can be incredibly useful for staying focused and intentional with who we desire to become and what we hope to accomplish in the future. 1. ALWAYS do your best | Our work effort should be high and directed toward God (Col. 3:23). This also creates solid character. 2. ALWAYS forgive yourself when you fail | You and I are going to fail. It’s inevitable. But if we don’t learn from our mistakes, give ourselves grace and move on…we will end up self-destructing. Give each new day a clean slate (Lam. 3:22-23). 3. ALWAYS look for the good in everyone | Noticing the positive traits in others (and acknowledging them) encourages and builds others up. Who doesn’t need more of that? This also changes the way we view people for the better. 1. NEVER Give up | You and I lose sight of our goals, hopes, dreams, and reason for living when we give up (1 Cor. 9:24). When you feel like giving up, seek a mentor immediately. Work through it with someone. 2. NEVER neglect your priorities | Relationship with Jesus, family, personal health, rest, and growth. These are some of examples. Whatever yours are, keep them in front of you at all times (Luke 12:34). Examine them to see how you are doing. 3. NEVER lose sight of your calling | This one helps us to avoid giving up. Whatever God has called you to, do it well (Eph. 4:1). He believes in you. Join the discussion and leave a comment below. So true. Thanks for leaving your comment, John.